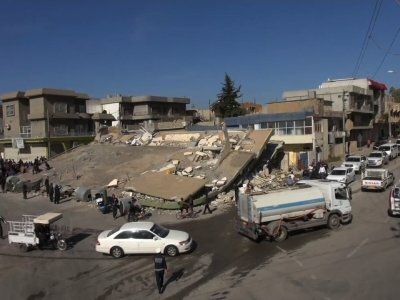 Israeli Prime Minister Benjamin Netanyahu says his country has offered the International Committee of the Red Cross “medical assistance for the Iraqi and Iranian victims” of this week’s earthquake. Neither Iran nor Iraq has diplomatic relations with Israel. It wasn’t immediately known whether the offer was accepted. Netanyahu made the comment during an interview broadcast to leaders of Jewish communities in North America. Iran’s state-run news agency says the country’s death toll from the powerful earthquake that struck the Iran-Iraq border has risen to 530. The report Tuesday afternoon by the IRNA news agency said the number of injured in the temblor now stood at 7,460. The magnitude 7.3 earthquake struck Sunday night Iran time, just as people were going to bed. The worst damage appeared to be in the Kurdish town of Sarpol-e-Zahab in the western Iranian province of Kermanshah. Iran’s President Hassan Rouhani says his administration will probe the cause of so much damage to buildings constructed under a state-owned program in the quake-stricken area along the border with Iraq. The official IRNA news agency says Rouhani made the remarks while touring the quake-hit Iranian Kurdish town of Sarpol-e Zahab on Tuesday. Many of the damaged buildings were built during former hard-line President Mahmoud Ahmadinejad administration, though some of them were completed and handed over to the residents under Rouhani. Under the plan dubbed Mehr, or “kindness” in Farsi, some 2 million units were built in Iran, including hundreds in Sarpol-e Zahab. Many warned that the low-quality construction could be problematic.